Attention lovers of NYC. Today was a long day of love exchanges of the material kind. I’d like to reflect upon the day and hope that we can extend this essential character of ourselves that is known as LOVE to those around us on a daily basis. Wait for the next train if it is too packed. Smile at tourists + strangers who stare or smile at you. Give proper directions to those who need it. Strike up a conversation with someone at a coffee shop. Help anyone who obviously needs it without expecting anything – not even a thank you. Refer a friend to a job you know they’d be good at. Don’t honk the horn . . . as much. Give back to your community – volunteer your time to a local charity, be involved in something bigger than yourself. Meditate – be aware of your self as you walk, talk, think and exist. In a city focused strongly on finance, money, and the art of insomnia, these tips above give you an alternate life. One that is more fulfilling, gratifying and rewarding than anything a job can give you. At a time when unemployment continues to rise and tougher times face us, I find that these small ways of giving back make each day a better one for your self and those around us. Let’s truly make our city (and state) slogan of I <3 NY mean something. With love, from me to you. I captured this from a wall in Chinatown, and it kinda got me thinking. I feel like sometimes, the message is simple and strong. I wish there was more like that. 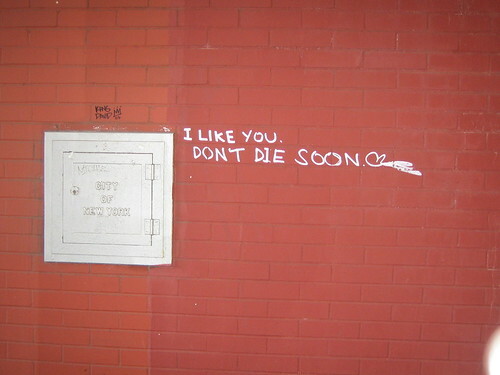 Posted in NYC Pics, Off the Beaten Track in..., On The Streets | Comments Off on DON’T DIE.